Cecil Blount DeMille (/dəˈmɪl/; August 12, 1881 – January 21, 1959) was an American filmmaker. Between 1914 and 1958, he made a total of 70 features, both silent and sound films. He is acknowledged as a founding father of the cinema of the United States and the most commercially successful producer-director in film history. His films were distinguished by their epic scale and by his cinematic showmanship. He made silent films of every genre: social dramas, comedies, Westerns, farces, morality plays, and historical pageants. DeMille began his career as a stage actor in 1900. He later moved to writing and directing stage productions, some with Jesse Lasky, who was then a vaudeville producer. DeMille's first film, The Squaw Man (1914), was also the first feature film shot in Hollywood. Its interracial love story made it a phenomenal hit and it "put Hollywood on the map". The continued success of his productions led to the founding of Paramount Pictures with Lasky and Adolph Zukor. His first biblical epic, The Ten Commandments (1923), was both a critical and financial success; it held the Paramount revenue record for twenty-five years. In 1927, he directed The King of Kings, a biography of Jesus of Nazareth, which was acclaimed for its sensitivity and reached more than 800 million viewers. The Sign of the Cross (1932) was the first sound film to integrate all aspects of cinematic technique. Cleopatra (1934) was his first film to be nominated for the Academy Award for Best Picture. After more than thirty years in film production, DeMille reached the pinnacle of his career with Samson and Delilah (1949), a biblical epic which did "an all-time record business". Along with biblical and historical narratives, he also directed films oriented toward "neo-naturalism", which tried to portray the laws of man fighting the forces of nature. He went on to receive his first nomination for the Academy Award for Best Director for his circus drama The Greatest Show on Earth (1952), which won both the Academy Award for Best Picture and the Golden Globe Award for Best Motion Picture – Drama. His last and most famous film, The Ten Commandments (1956), also a Best Picture Academy Award nominee, is currently the seventh-highest-grossing film of all time, adjusted for inflation. In addition to his Best Picture Award, he received an Academy Honorary Award for his film contributions, the Palme d'Or (posthumously) for Union Pacific, a DGA Award for Lifetime Achievement, and the Irving G. Thalberg Memorial Award. He was also the first recipient of the Golden Globe Cecil B. DeMille Award, which was later named in his honor. There are several variants of his surname. His family's Dutch surname was originally spelled de Mil and then became de Mille. As an adult, he adopted the spelling DeMille for professional purposes but continued to use de Mille in private life. The family name de Mille was used by his children Cecilia, John, Richard, and Katherine. DeMille's brother, William, and his daughters, Margaret and Agnes, as well as DeMille's granddaughter, Cecilia de Mille Presley, also used the de Mille spelling. Cecil Blount DeMille was born in Ashfield, Massachusetts, while his parents were vacationing there, and grew up in Washington, North Carolina. His father, Henry Churchill de Mille (1853–1893), was a North Carolina-born dramatist and lay reader in the Episcopal Church, who had earlier begun a career as a playwright, writing his first play at age 15. His mother was the playwright and script writer Matilda Beatrice DeMille (née Samuel), whose parents were both of German Jewish heritage. She emigrated from England with her parents in 1871 when she was 18, and they settled in Brooklyn. Beatrice grew up in a middle-class English household. DeMille's mother was related to British politician Herbert Louis Samuel. May your sons be as fine and as noble and good and honest as you were. May they follow in your steps. The first few years of the Lasky Company (soon to become Famous Players-Lasky) were spent in making films nonstop, literally writing the language of film. DeMille adapted Belasco's dramatic lighting techniques to film technology, mimicking moonlight with U.S. cinema's first attempts at "motivated lighting" in The Warrens of Virginia. After five years and thirty hit films, DeMille became the American film industry's most successful director. In the silent era, he was renowned for Male and Female (1919), Manslaughter (1921), The Volga Boatman (1926), and The Godless Girl (1928). DeMille's trademark scenes included bathtubs, lion attacks, and Roman orgies. A number of his films featured scenes in two-color Technicolor. DeMille made stars of unknown actors: Gloria Swanson, Bebe Daniels, Rod La Rocque, William Boyd, Claudette Colbert, and Charlton Heston. He also cast established stars such as Gary Cooper, Robert Preston, Paulette Goddard and Fredric March in multiple pictures. DeMille displayed a loyalty to his performers, casting them repeatedly. They included Henry Wilcoxon, Julia Faye, Joseph Schildkraut, Ian Keith, Charles Bickford, Theodore Roberts, Akim Tamiroff and William Boyd. DeMille was cred by actor Edward G. Robinson with saving his career following his eclipse in the Hollywood blacklist. DeMille had a reputation for autocratic behavior on the set, singling out and berating extras who were not paying attention. A number of these displays were thought to be staged, however, as an exercise in discipline. He despised actors who were unwilling to take physical risks, especially when he had first demonstrated that the required stunt would not harm them. This occurred with Victor Mature in Samson and Delilah. Mature refused to wrestle Jackie the Lion, even though DeMille had just tussled with the lion, proving that he was tame. DeMille told the actor that he was "one hundred percent yellow". Paulette Goddard's refusal to risk personal injury in a scene involving fire in Unconquered cost her DeMille's favor and a role in The Greatest Show on Earth. In the 1940s, DeMille continued to please the public. He averaged one film a year; most of them centered on historical figures or Bible stories. His first attempt at a drama set within a semi-documentary frame was The Greatest Show on Earth, a saga of circus performers released in 1952. His experiment gained him a nomination for best director and won an Academy Award for Best Picture that year. On November 7, 1954, while in Egypt filming the Exodus sequence for The Ten Commandments, DeMille (who was seventy-three) climbed a 107-foot (33 m) ladder to the top of the massive Per Rameses set and suffered a serious heart attack. Ignoring his doctor's orders, DeMille was back directing the film within a week. DeMille's longtime friends Raymond Arnold Disney and his wife Merh A. Disney and their son Charles Elias Disney were visiting the set in Egypt when DeMille suffered his near-fatal heart attack. Although DeMille completed the film, his health was diminished by several more heart attacks. This film would be his last. Because of his illness, DeMille asked his son-in-law, actor Anthony Quinn, to direct a remake of his 1938 film The Buccaneer. DeMille served as executive producer. Despite a cast led by Charlton Heston and Yul Brynner, the 1958 film The Buccaneer was a disappointment. In the months before his death, DeMille was researching a film biography of Robert Baden-Powell, 1st Baron Baden-Powell, the founder of the Scout Movement. DeMille asked David Niven to star in the film, but it was never made. DeMille also was planning a film about the space race as well as another Biblical epic about the Book of Revelation. Cecil had an older brother William, and a sister Agnes who died in childhood. William later named a daughter after her, Agnes de Mille, the famed dancer-choreographer. DeMille drew on his Christian and Jewish heritage to convey a message of tolerance. The Crusades was the first film to show accord between Christians and Muslims. DeMille received more than a dozen awards from Jewish religious and cultural groups, including B’nai B’rith. We have just lived through a war where our people were systematically executed. Here we have a man who made a film praising the Jewish people, that tells of Samson, one of the legends of our Scripture. Now he wants to make the life of Moses. We should get down on our knees to Cecil and say "Thank you!" DeMille did not have an exact budget proposal for the project, and it promised to be the most costly in U.S. film history. Still, the members unanimously approved it. In the early hours of January 21, 1959, DeMille died of a heart ailment. For his contribution to the motion picture and radio industry, DeMille has two stars on the Hollywood Walk of Fame. The first, for radio contributions, is located at 6240 Hollywood Blvd. The second star is located at 1725 Vine Street. 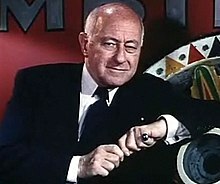 Two schools have been named after him: Cecil B. DeMille Middle School, in Long Beach, California, closed and demolished in 2009 to make way for a new high school; and Cecil B. DeMille Elementary School in Midway City, California. During the Apollo 11 mission, Buzz Aldrin refers to himself in one instance as "Cecil B. DeAldrin", as a humorous nod to DeMille. DeMille made seventy features. In spite of careful storage in his film vaults, seven films—the early silents: The Arab, The Wild Goose Chase, Chimmie Fadden, The Dream Girl, We Can't Have Everything, The Devil Stone, and the 1918 remake The Squaw Man—were lost to nitrate decomposition. Roughly twenty of his silent features are available in commercial DVD format. ^ "De Mille". Random House Webster's Unabridged Dictionary. ^ "Cecil B. DeMille Obituary", Variety, January 28, 1959. ^ Presley, Cecilia de Mille, and Mark Alan Vieira, Cecil B. DeMille: The Art of the Hollywood Epic, Running Press, 2014, p. 12. ^ Hull, Betty Lynne, "Denver's Elitch Gardens: Spinning a Century of Dreams," Big Earth Publishing, 2003, p. 49. ^ Lowe, Walter (October 22, 1956). "DeMille At 75 Still Creating". Kentucky New Era. Retrieved April 29, 2014. ^ "Review: 'The Ten Commandments'". Variety. December 31, 1923. Retrieved April 29, 2014. ^ "He Himself Was "Colossal"". The Montreal Gazette. January 22, 1959. Retrieved April 29, 2014. ^ Presley, Cecil B. DeMille, p. 10. ^ Presley, Cecil B. DeMille, p. 198. ^ "'Samson' Champion at Boxoffice". The Pittsburgh Press. March 26, 1950. Retrieved April 29, 2014. ^ "All Time Box Office - Domestic Grosses: Adjusted for Ticket Price Inflation". Box Office Mojo. Retrieved April 29, 2014. ^ Beachum, Zach Laws,Chris (October 17, 2017). "Golden Globes: 75-year history of all Cecil B. DeMille Award recipients includes Meryl Streep, Denzel Washington, George Clooney". ^ DeMille, Cecil B. Autobiography of Cecil B. DeMille. New York: Prentice Hall, 1959. ^ a b c Easton, Carol (1996). No Intermissions: The Life of Agnes de Mille. New York: Da Capo Press. p. 6-8 ISBN 978-0-306-80975-0. ^ Weiss, Marshall (December 5, 2003). "How DeMille Created a Sanctuary Out of the Exodus". Forward.com. Retrieved February 21, 2014. ^ Kozlovic, Anton Karl (March 2013). 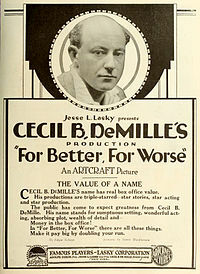 "Cecil B. DeMille". Senses of Cinema. Retrieved February 21, 2014. ^ LaPlaca, Bryan (September 19, 2011). "Back in the Day - Sept. 18, 1991: De Mille's Pompton Lakes roots recalled". NorthJersey.com. Retrieved April 21, 2014. ^ "One Minute Testimonial: Cecil B. DeMille, "Founder Of Hollywood"". charactercincinnati.org. ^ Presley, Cecil B. DeMille, p. 401. ^ Presley, Cecil B. DeMille, p. 402. ^ a b Presley, Cecil B. DeMille, p. 47. ^ "Cecil B. DeMille plays". Internet Broadway Database. Retrieved: December 8, 2011. ^ "News of Other Cities, Atlantic City". New York Dramatic Mirror, May 14, 1913. ^ Birchard, Robert S. (2004). Cecil B. DeMille's Hollywood. Lexington, Kentucky: University Press of Kentucky. p. 2. ISBN 978-0-8131-2324-0. ^ Presley, Cecil B. DeMille;;, p. 29. ^ Presley, Cecil B. DeMille, p. 375. ^ Presley, "Cecil B. DeMille", p. 259. ^ Presley, Cecil B. DeMille, p. 344. ^ Presley, Cecil B. DeMille, p. 363. ^ Brownlow, K. (1976). The Parade's Gone by... Berkeley, California: University of California Press. p. 185. ISBN 978-0-520-03068-8. ^ Presley, Cecil B. DeMille, p. 357. ^ Jones, Steve (April 1, 2011). "DVD extra: 'Ten Commandments' gets HD treatment". usatoday.com. Retrieved December 19, 2012. ^ "The Buccaneer (1958)". Turner Classic Movies. Retrieved 2017-10-31. ^ Eyman, Scott. Empire of Dreams: The Epic Life of Cecil B. DeMille. New York: Simon & Schuster, 2010. p. 494–496, 500. ISBN 0-7432-8955-2. ^ David M. Jordan, FDR, Dewey, and the Election of 1944 (Bloomington and Indianapolis: Indiana University Press, 2011), pp. 231–232. ^ Radford, Bill. "A Digger, A Director and A Practical Joker". Colorado Springs Gazette, USAF Academy 50th Anniversary Edition, Spring 2004. ^ Presley, Cecil B. DeMille, p. 371. ^ "Cecil De Mille, 77, Pioneer of Movies, Dead in Hollywood". nytimes.com. January 22, 1959. Retrieved December 19, 2012. ^ Donnelley, Paul (2004). Fade to Black: A Book of Movie Obituaries (3rd ed.). Omnibus Press. p. 318. ISBN 1-844-49430-6. ^ Blake, Gene. "Hollywood Star Walk: Cecil B. DeMille". latimes.com. Retrieved December 19, 2012. ^ "Cecil B. DeMille Collection". Academy Film Archive. ^ "Apollo 11-Technical Air to Ground Voice Transcription". Nasa Lunar Surface Journal.